Table indexes should be managed internally through application designer for each record definition. You can view indexes by opening a record definition (e.g. PSRECDEFN) and selecting Tools > Data Administration > Indexes. As you can see in this example, the record PSRECDEFN has six indexes. One key index (index ID _) and five user indexes (index IDs A-E). It is a good idea of getting into the habit of adding comments when you add your own user indexes to records. The following queries gives you a summary of the indexes on a particular PeopleSoft record. The first query works at the PeopleTools meta-data layer. It uses the PeopleTools record definition table (PSRECDEFN) and the PeopleTools index definition table (PSINDEXDEFN). It returns the record name, description, a count of the number of indexes set on that record in PeopleTools, the SQL table name (if set), the PeopleSoft index name, index ID and index type. Note that the primary key index is always unique and is always named PS_ + RECNAME. For instance the primary index for PSRECDEFN is PS_PSRECDEFN. Also the index ID is always a single underscore _ and the index type is 1 for key. The second query works at the Oracle database layer by checking the DBA_INDEXES Oracle system table for indexes that relate to the specified PeopleSoft record. 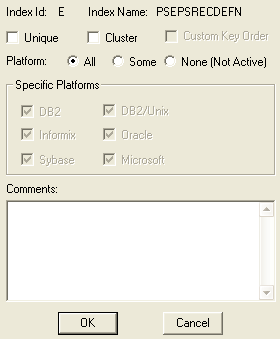 In order to run this query, you will need to be logged in as a user with access to DBA_INDEXES. Note that you can substitute DBA_INDEXES with ALL_INDEXES however, DBA_INDEXES can see more than ALL_INDEXES and may include indexes not visible through ALL_INDEXES depending on the account you are logged in as. Don't forget to replace <record_name> with the appropriate PeopleTools record name. While running the above queries, you may find some discrepencies between index information in PeopleTools and index information in the Oracle database. To further complicate matters, application designer may be misinforming you! 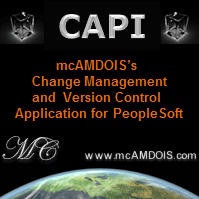 To explain what I mean, I found that the record ACCT_CD_TBL only had three indexes in PeopleTools. I confirmed this using the PeopleTools index information query above. The index count returned by PSRECDEFN was 3, and there were only 3 index IDs in PSINDEXDEFN (_, 0, 1). A total of 11 indexes. What's going on? By the way I've only shown the bottom of the scroll in the screenshot, but be assured there were a total of 11 indexes including the primary index (_) and 10 user indexes (0-9). Initially I thought I was looking in the wrong PeopleTools tables. But eventually I figured it was application designer playing tricks. To confirm this, I traced application designer while performing a build index script (Build > Current Definition > Create Indexes & Build script file). Turns out application designer also uses DBA_INDEXES when it loads index information and creates build scripts! So it can appear that indexes exist in PeopleTools when in fact they really don't. To get a better picture of PeopleTools indexes versus database indexes, the following queries identify cases where indexes exist in PeopleTools but not in the database or vice versa, when they exist in the database but not in PeopleTools. Note you will need to replace <owner> with the database user that owns your PeopleTools tables (e.g. SYSADM). Hopefully these queries help you find out what's really going on with your indexes.